Greetings goblins, ghosts, ghouls, witches, monsters, etc.! Welcome to a special addition of the DPL's Haunted Spooktacular. I haven't done an artist's spotlight in some time and this month seemed like a natural to do one for a good friend of mine, VLADEN13. Note that you need to have a DeviantART account in order to view his "mature" works. The exceptions being the works I'm posting, to-day. With permission, of course. Vladen, like most artists, has developed his own unique style of art. One I've become quite a fan of. For obvious reasons you will soon see. I'm even a bigger fan of his older works and have permission to post some more of them but that will be in a later post. Vladen's been around DA (what most of us refer to DeviantART as ), for nearly three years. 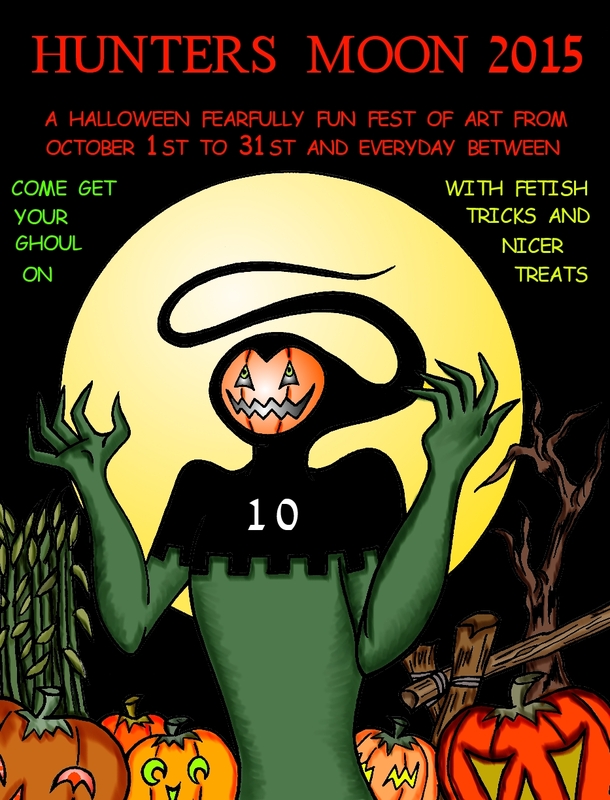 And this year marks the 3rd installment of his "Hunter's Moon" celebration of all things DID and Halloween! It's also the first year for me to be able to submit any of my own work to this great review. But enough prattle about my pathetic attempts at art. ON WITH THE HUNT! Vladen draws upon what he knows and grew up with so, it's not unusual to see familiar characters, especially from past cartoons of the '60's & '70's. Like poor Daphne Blake above. He has done quite a few works involving Daphne, even some in glorious black & white. But Vladen is also known to draw upon various "bondagettes", like Harmony's Spellbinder (of which we are both huge fans of...in any version). And always with a emphasis on peril and...well...you can see for yourselves, heh, heh. Spellbinder is also the user name of one awesome lady on DA. Just enter her name in the DA search engine & you'll find her page. Or you can be super lazy and just click on the link above. I'm not sure what inspired this next work (above) but I can tell it's based on a certain comic-book character from the '80's, Cherry Poptart, of which, I'll eventually, have a few of her stories here on the DPL. This work also pays a bit of homage to an old Brenda Starr cover. This is one of Vladen's older works before he got involved with digital art. Something I'm still loathe to try. Another, older, Halloween-themed work appears below. I guess she's in for a few tricks, heh, heh. Vladen has also done some terrific work on O.C. 's (Original Characters) of other Deviants, like WALNUT WILLY'S Night Kitten and JOKER IS MY NAME, below. Won't some-one rescue her? But this is just a sampling of Vladen's work. Trot on over to his DA page to see more and join in the celebration of all that's Halloween and damsels in distress, like more of Daphne and Velma!